Some time back, I wrote an article on the best homemade anti-aging face masks that help get youthful skin easily, which was quite appreciated by many. In it, I had given a list of home remedies using several natural medicinal ingredients of varied categories like for example, spices, fruits, vegetables, oils etc. and after that, I got some requests to write on some anti-aging face masks using that will include several anti-aging herbs and hence this post. 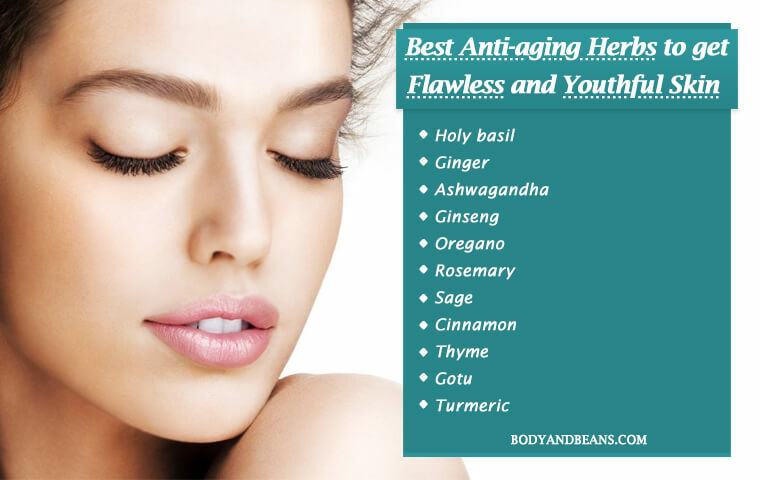 In this post, I am going to share a list of 11 best anti-aging herbs that can help you get flawless glowing and youthful skin easily and naturally. If we look at ancient Indian tradition as far as medicine goes, it is the herbs that has treated mankind over the ages. These herbs have saved many from different types of health and beauty complications. So, when Mother Nature has gifted us with so many medicinal herbs, we can definitely use it to the best of our advantage, and using these herbs to get flawless, glowing and youthful skin is no exception. Therefore, this post; Today I am sharing a comprehensive list of top 11 of the best magical anti-aging herbs that you can use to get flawless, glowing and youthful looking skin naturally. If you are looking for best natural remedies to get that perfect glow then here’s a must read post for you. Aging is a natural process, and with age, our skin also shows several aging symptoms like wrinkles, fine lines, sagginess, dullness etc. We have no control over and cannot stop this natural aging phenomenon. But we can definitely delay the aging process and their accompanying consequences with proper remedies and adjustment to our day to day lifestyle. We can use some of these anti-aging herbs that we get from the Mother Nature and deal with skin aging issues naturally and easily. However, age is not the only factor that makes our skin loose it glow and become dull and full of wrinkles. But it is also the pollution around us, too much of anxiety, stress and depression, our bad food habits, excessive sun exposure, unhealthy lifestyle practices, diseases etc are the other factors that can often lead to premature aging of skin. So, we must be very careful about all of these factors to avoid the occurrence of premature aging. And, as far as your skin is concerned, to maintain that youthful charm for a long time, you can easily try some of these magical anti-aging herbs to get flawless, glowing, and youthful looking skin naturally and easily. There is no doubt that the natural home remedies are the best and when the ingredients to be used contain the herbs that represent the traditional medicinal practices in India, the results can be even more enchanting. This is because no matter how technologically advanced or expensive cosmetic products you use to look beautiful, the ancient men and women (although not that refined) were naturally far healthier looking than we are today. Thanks to the purer ingredients and herbs they used to solve different health and beauty issues. Ayurveda has always used the herbs as their main ingredient to solve the beauty and health issues of mankind. And today, we will thus incorporate some of those best anti-aging herbs in our natural home remedies to get the youthful skin that we all desire. So, without wasting time, let’s just dive in. Holy basil, also known as “tulsi” is a wonder herb that you can definitely use to bring back or retain that youthful charm on your face. Studies have already proven the anti-aging effects of basil where it helped in retaining the moisture of the skin and in reducing the roughness. It is equally beneficial in reducing occurrence of wrinkles and kept the skin very soft and smooth. Basil also gives protection to your skin from the harmful ultraviolet rays of the sun which otherwise leads to depletion of collagen, the compound that helps to maintain the elasticity of the skin. So, using basil is definitely a great option to look for fighting your aging signs. To enhance the good effects, I will suggest you to add some gram flour and honey as well as they will help in the brightening and moisturizing part of your skin. Take some holy basil leaves (around 1 cup) and soak in warm water for sometimes and then grind it into a paste. Once you have the paste, take it in a clean bowl and mix around 1 tablespoon of gram flour and 1 teaspoon of honey to it. Then apply the paste evenly on your face and let it dry naturally. After sometime, wash your face using lukewarm water to retain and get the glow of your skin. You may use ginger as a spice to add flavor to the dishes but it has been popularly used in Ayurveda and in Chinese medicine as an herb to gain anti-aging benefits and in curing several ailments. The reason why ginger is as efficient as an anti-aging herb is because it is rich in antioxidants and is anti-inflammatory in nature which helps in delaying the aging process of the skin. In one of the studies, it was seen that ginger had the potential to restrict the production of toxic free radicals that if not controlled can damage your metabolic functioning and also lead to oxidative stress which in general is harmful for your skin. While using the ginger remedy, I will suggest you to use some olive oil and sugar to enhance the good effects. Then take around 1 tablespoon of grated ginger, 2 tablespoons of olive oil and 4 tablespoons of brown sugar and mix all of them well. Now, clean your face using a very mild cleanser and then Apply and scrub the mixture on the wrinkles, fine lines and other aging spots for around 10 minutes. Keep it for 5-10 minutes after that and then wash your face using lukewarm water. There are several benefits of Ashwagandha and as per modern research, you can definitely include its ability to fight the symptoms of aging skin to be one of them. The reasons why it can delay the aging process and keep the skin healthy and youthful for long are because it is antimicrobial, can boost the cognitive functioning and is rich in alkaloids that protect the skin cells (also other cells) from oxidative stress and damage. To make the remedy exceptional, you can use little bit of the anti-aging ginger and diluted lemon juice along with Ashwagandha if you want to. Mix half teaspoon of Ashwagandha powder, half teaspoon of dried ginger powder and half teaspoon of diluted lemon juice well and make a paste out of them. In case it becomes too thick, you can always add water to it to get the consistency of your choice. Apply all over your face, neck and other aging portions and keep it for some time to dry. After that, rinse off using water. Ginseng is a Chinese medicinal herb that is popular all over the world because of the anti-aging effects it has on human skin. A study was conducted using the mixture of ginseng and Chinese hawthorn and it was shown to give excellent protection to the skin from the harmful effects of aging. Ginseng is very effective in preventing the occurrence of wrinkles and improves moisture retention and procollagen synthesis in your skinwhich turn, helps delay the aging process. To gain the maximum benefits, simply take around 1 teaspoon of ginseng powder and mix it in a cup of warm water. Allow it to cool a bit and then apply the paste on your aging marks properly using cotton balls. Do this before going to sleep and let it stay all night long. Wash your face with lukewarm water the next morning. This anti-aging herb is not just tasty but it is equally beneficial in fighting the problem of premature aging of your skin and after several experiments, it is included among the list of natural weapons and strategies to undertake in order to prevent skin aging. Oregano is a powerhouse of several healthy antioxidants and flavonoids that prevent the free radicals from damaging your skin which in turn delay the aging process. Besides the several antioxidants, the oil extracted from the herb is loaded with Vitamins A, C and E which also aids in keeping your skin healthy and youthful looking. Oregano oil is great but I want you to add any carrier oil like coconut, olive or jojoba oil in the remedy togain more benefits. Mix around 10-15 drops of oregano essential oil with 2 tablespoons of any carrier oil of your choice. Now, message the mixture on your face, neck and other aging skin parts. Do it before bedtime and let it stay overnight. Rinse the oils properly the next day to prevent skin aging issues. The harmful ultraviolet rays of the sun damage the skin to a great extent causing wrinkles, fine lines, dark patches, excessive tanning and other skin issues. But, thanks to the nutritious rosemary, now you can easily prevent photo damage and improve the elasticity and overall health of your skin. Rosemary is an excellent versatile herb which you can use to add flavor and aroma to your cooking as well as can use it for skin benefits. In addition to the above, rosemary contains carnosic acid that helps in prevention of age related neurodegenerative diseases by combating the free radicals which is present inside your brain. Make use of a bit apple cider vinegar so that you get the benefits of it as well. But, carefully follow the method I am suggesting. Here, you need to arrange for 2 fresh sprigs of rosemary, 3 tablespoons of apple cider vinegar and 2 cups of water. Mix all of the ingredients in a container and boil on medium flame. Simmer until the quantity of the mixture is reduced to half. Then allow it to cool and after that, sprain it and keep it in a spray bottle. Use it as a toner for your aging skin. Sage, also known as salvia is one of the best anti-aging herbs to get the glowing, youthful skin, thanks to the presence of the several antioxidants in it that helps in the reversal of the skin aging signs. The antioxidants fight the free radicals and inhibit them from causing any damage to your skin. Sage is also loaded with flavonoids, phenolic diterpenes and phenolic carboxylic acids which along with the other antioxidants prevent skin aging. Take around 1 ½ teaspoons of sage leaves and keep it in a pan that contains around 1 cup of water. Now, steep it for 20-30 minutes. After that, it is time to concentrate on straining the liquid well. After you have done that, allow it to cool and then store it in a glass bottle. Now, you need to use it as the toner to fight the aging spots of your skin and gift your skin with that healthy and youthful glow. Cinnamon is a powdered spice but it is made from the different parts of the trees, so it contains the medicinal properties of the plants which fall into the category of genus “Cinnamomum”. And, that is why you can use it to get rid of your premature aging symptoms, if you want to. Cinnamon is proven by science to boost the process of synthesis of collagen and prevent its breakdown. It also helps in retaining the elasticity of the skin, thereby making your skin look young and charming. Cinnamon itself is very beneficial, but I want you to add some raw honey in the remedy to keep your skin moisturized and soft. Take around 1 teaspoon of cinnamon powder and 1 tablespoon of raw honey and mix the two of them really well. Now, apply the paste on your face, neck etc. and keep for at least 10-15 minutes. After that, wash off using lukewarm water. Besides using it to add flavor to your food, it is time that you use this magical herb to gain some anti-aging skin benefits. This is because it contains several antioxidants that will help you in fighting the harmful radicals and will prevent skin damage. Moreover, the most active ingredient in thyme is carvacrol which makes thyme anti-inflammatory and also helps in preventing skin infections. So, all in all, thyme is a great herb which you can definitely use to gain that youthful skin that you desire. In the thyme remedy, I want you to add little alcohol-free witch hazel as well for the betterment of the end result. Take a jar made of glass and add around 1 tablespoon of dried thyme and ½ cup of alcohol-free witch hazel into it. Let thyme soak in witch hazel for 7 days and then you will have to strain it and use it as a toner. The medicinal uses of turmeric are not unknown to us but did you know that this is one of the most popular herbs that is often used for its anti-aging properties? Well, in case you are not aware of it, let me tell you that turmeric contains curcumin which is a great antioxidant that can fight the free radicals which otherwise cause damage to your skin. It is also anti-inflammatory in nature and gives protection to your skin from the ultraviolet induced aging signs. So, you can definitely use turmeric to fight your aging signs. To make the remedy even more effective, you can add a bit of raw honey to it. Lemon essential oil can also be added but it is optional. Take around ½ teaspoon of turmeric, 1 tablespoon of raw honey and 1 drop of lemon essential oil. Mix all of them and make a good paste out of it. Apply the mask on your face, neck and other portions of your body. Massage for around 10 minutes. After that, keep it for 10 minutes or till the time it has completely dried and then wash it off. Besides being a traditional remedy for hepatitis and varicose veins, Gotu kola is also a magic remedy for fighting the problem of premature skin aging. The main reason behind its effectiveness is because it stimulates synthesis of collagen that helps in keeping the skin very firm and soft. 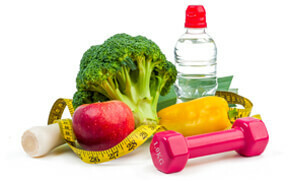 As per Ayurveda, it also helps in striking a balance in your body. I want you guys to use some sesame oil and a handful of calendula flowers in this remedy to magnify the good effects. Take a glass jar and put some dried Gotu kola and some calendula flowers in it. After that, pour some sesame oil in it until the oil has completely covered the herbs. Now, fasten the lid of the jar very well and give it a good shake. Keep it under the sun to infuse for 2 to 3 weeks. After that, use it to massage your face, neck and other body parts having aging signs. Over to you: how do you fight skin aging symptoms? It is hard to accept the fact that we are aging by each passing day, but it is true and is a part of the natural phenomenon. Well, we can never stop it but can definitely delay the aging process and the occurrence of aging symptoms especially when it comes to aging skin. This is because our aging skin is the external manifestation of our aging body and we can, to a great extent, reverse or delay skin aging by caring for it and by maintaining a perfect skincare routine. And, as far as maintaining skincare routine to avoid aging goes, we can definitely take the help of natural ingredients, more specifically, the magical anti-aging herbs as they are excellent in fighting aging skin symptoms. Ayurveda have been an integral part of our lives and it was there since the time when science and modern technologies were not present. Hence, it has already served lot of people and will be serving many more in the upcoming years. Now, when it comes to anti-aging, Ayurveda has always depended on the natural herbs to gain the maximum benefits and so if you want to treat your aging skin issues naturally, I think using the herbs we have discussed will be highly beneficial for you in fighting skin aging issues. We have already discussed about the top 11 anti-aging herbs to get glowing, youthful and flawless looking skin naturally. These anti-aging herbs are safe, very cost effective and work fast, so you can expect quick results in fighting skin aging issues. I have given the method of usage as well, so you can follow those steps while applying the herbs on your aging skin to get maximum benefits in skin care. Needless to say, besides using these home remedies, try to lead a disciplined and healthy life as that will also contribute a lot in making you look younger and charming for long. I hope these anti-aging herbs will come to your benefit a lot but still, I want you guys to share me your feedbacks on this. You can also share your suggestions and advices with me. I will also be happy if you tell me and my other readers your secret to looking youthful and charming. How do you deal with skin aging issues, by the way? Until then, stay healthy, stay beautiful.